By default, filters in Yahoo Mail are AND filters. They combine all specified criteria when filtering incoming messages. How do you set up an OR filter where just one of several criteria must be true? You use a workaround. Yahoo Mail AND filters only take action when all the criteria are met. You can set up a single filter that moves a message from a certain sender and has a specific subject, but you can't set up a filter from a certain sender or has a specific subject, for example—at least you can't do that with just one filter. A simple workaround exists, though. You create an OR filter in Yahoo Mail using two filters. First, you set up one filter (say from a certain sender) and then you set up a different filter for the second criterion (for messages with a specific subject, for example). Instruct both filters to move their messages to the same folder, and you have constructed an OR filter. All messages from that sender or with the subject or both will show up in the target folder automatically. 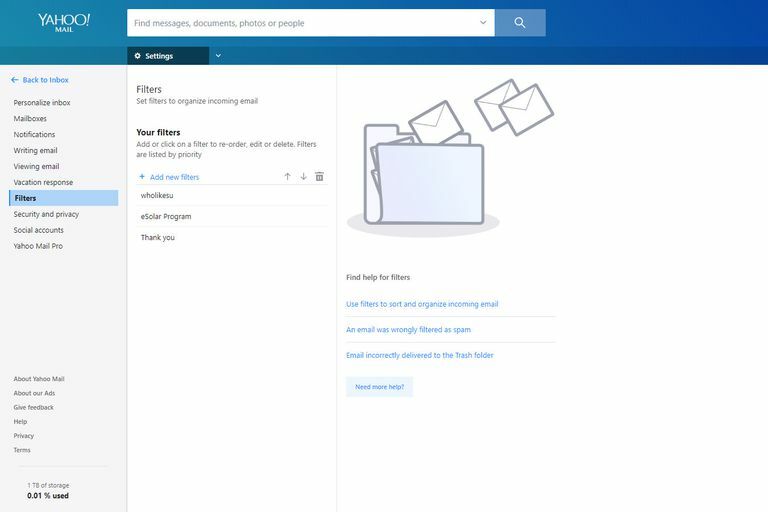 Click the Gear icon at the top of the Yahoo Mail screen. Click Filters in the left sidebar. Fill in the form that appears using the drop-down menus to specify the first criterion for this filter and specify the folder you want to move the message to whenever the filter is applied. Repeat the entire process for a second filter using the second criterion. Direct it to the same folder as the first filter and save it. The two filters combine to give you the OR filter you want. Although this example shows only two criteria, you can create filters for as many OR conditions as you need by repeating the process over and over.